Mix the above in a bowl then form 8 patties. We use this Mr. Bar-B-Q Multi Layer Burger Press that I picked up on a whim at a kitchen outlet store. Grill the patties on high until done (about 2.5 minutes on each side.) 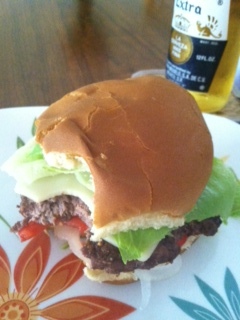 And you know the rest; buns or lettuce wrap, tomato, cheese, onion, condiments, the works. What are your favorite burgers? What are your favorite foods for fitness? I love using oats instead of bread crumbs as a binder for meat. I think it also holds the moisture well without keeping the grease. Looks awesome Angie! Sounds GREAT, Angie. 🙂 I’ll have to do without the oats though. Our ketogenic thing doesn’t allow grains in our diet.